We've been fairly lax in regards to our budgeting, but the time is right to really get things moving forward. One of our big goals for 2019 is to focus on our monthly spending. When it comes to personal finance it's rather simple: income - expenses = savings and savings x investing = financial independence. There's obviously two main levers there and while we'd all like to increase our income, many times reducing expenses is some of the low hanging fruit that you can go after to increase your savings. Total income for February wasn't quite as strong as January's banner month; however, you won't hear me complaining with the $8,293.51 of income. 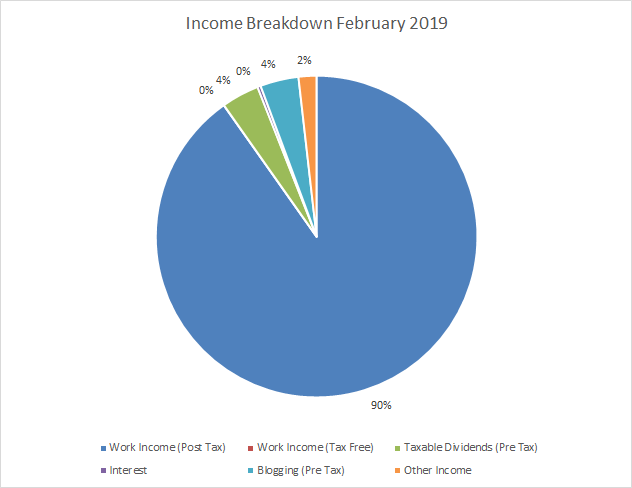 As most people in the accumulation phase, the bulk of my income, 90%, came from my day job, with the balance coming from interest, dividends, pre-tax blogging and other. Luckily February's expenses fell back in line after January's $10k+ month of expenses. Don't worry I didn't go on a spending spree it was just our property tax bill coming due. Total expenses for February came in at $3,223.62 which is still higher than I'd like but we're still adjusting to the higher car insurance rate as well as the payment on my new car. Ugh! All in all though expenses looked decent all things considered. The reason I say that is that counting mortgage, car insurance, home owners insurance and the new car payment requires a minimum payment of $2k per month so $1,200 or so of additional spending isn't too bad although I do want to get the expenses down lower. 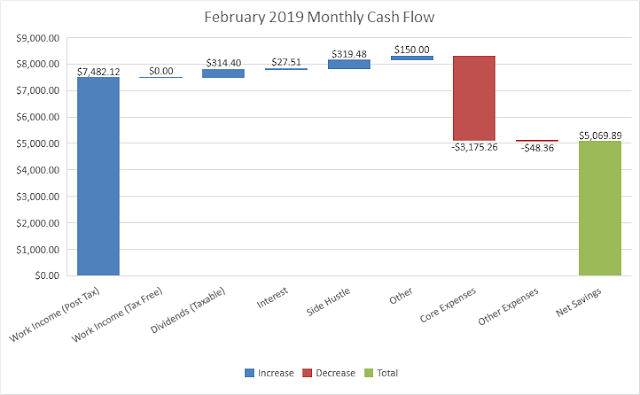 That puts the net cash flow for February at a positive $5,069.89. Our savings rate from all income sources was 61% and from work income alone it was 57%. Each month I like to examine the state of our non-work cash flow. Since our goal is to become financially independent the monthly cash flow has to come from somewhere in order to cover our expenses. I break our non-work cash flow into 2 categories: (1) Passive Income - dividends and interest and (2) Non-Work Income - all income from outside of my day job. Passive income for February totaled $341.91 and covered 10.8% of core expenses. Non-Work Income totaled $811.39 and covered 25.6% of core expenses. Last year saw a bunch of changes and other needs for our cash that didn't allow us to make as much progress as I would have liked throughout the year. However, with a new year under way that brings new opportunities to make improvements. Reducing our expenses is going to be our main focus for the year which will be accomplished by (1) paying off my wife's car loan and (2) by looking for ways to save whether that's cutting back on some things or searching for new and cheaper alternatives. All in all February was a great month with expenses normalizing and our cash flow coming in very strong at over $5k. We still have a lot of work to do, but our cash buffer is built up nicely to get us through the first few months with our new baby due in April. If all goes well then we should be able to pay off the loan on my wife's car and get back investing on a monthly basis sometime in July. What are you doing to improve your cash flow situation? 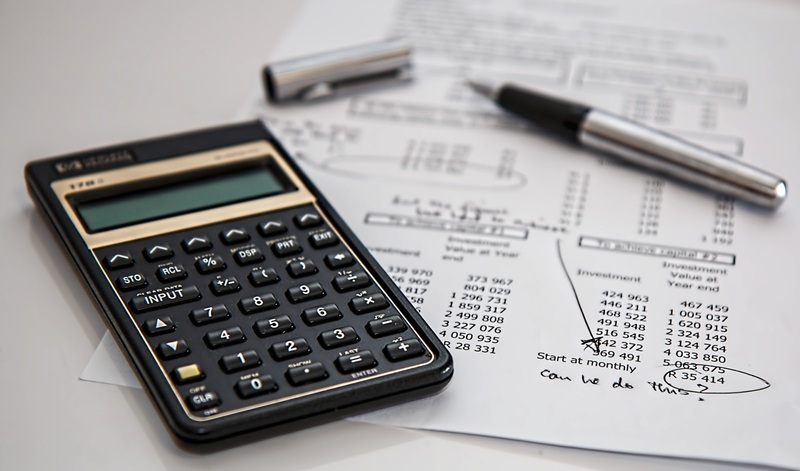 Are you working on reducing expenses or increasing income?